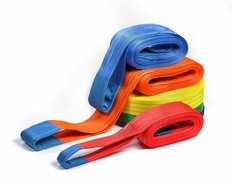 Softstrop polyester webbing slings are manufactured in the UK using only the highest quality yarns, and are supplied with reinforced becket eyes each end (excludes 500 kg simplex and 1000 kg duplex webbing slings, these come with reinforced flat eyes as standard). Webbing slings are available as either simplex (single ply), or duplex (twin ply) versions. Essentially the difference is that the single ply webbings are wider than the duplex version on a load for load basis. A Simplex webbing sling with a Safe Working Load of 2000 kg would be 100 mm in width, whereas the Duplex version would be 60mm in width. Softstrop polyester webbing slings are available in capacities up to 20 tonne and can be manufactured in lengths to suit your requirements. The table below details the product codes for the more popular sizes of Softstrop webbing slings.